All parasitic wasps are parasites to other animals, insects mainly. Many of them are very specialized and attack one species or one genus only. They may also specialize in attacking their victim in just one stage: larva for instance. Due to all these specializations there are so many species. Glyphicnemis profligator is a specialist, for it attacks certain sawfly families only. First of all the larvae and pupae of the Conifer Sawflies (Diprionidae) and secondly the pupae of members of the True Sawfly family (Tenthredinidae). 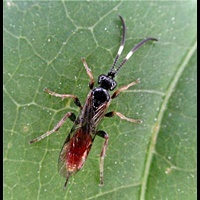 Especially in Eastern Europe it is highly regarded as a destroyer of the harmful European Pine Sawfly (Neodiprion sertifer). This species is much more harmful in Eastern European pine forests than in Western European's. In the antennae sits a white band. There are other species with such a white circle as well and usually only females possess them. This page has last been modified on Wednesday, August 22, 2018.